RECRUITview™, is a cloud-based, High Impact Recruitment Management System™designed to help employers and recruiters strategically attract and hire better talent, more efficiently. First generation “Applicant Tracking” solutions simply got rid of paper during the hiring process, but didn’t add much strategic value. RECRUITview™ is built for today’s recruiter to help them work smarter, more streamlined and strategic in order to build a more competitive workforce. Using the latest in HR processes, best practices and technology, RECRUITview™ will help you compete for, hire, and align the right people with the right jobs for your company’s needs. Attract High Quality Talent at a Lower Cost – RECRUITview™ provides the strategic tools to help find the best talent, align them with the right jobs and do so with an efficient workflow. Increased Number of Qualified Candidates – RECRUITview™ gives your organization a broader reach across all the most important internal and external recruiting channels including career sites, social media, job boards and more. Faster Hiring Time. Lower Hiring Costs. – RECRUITview™ can speed up and streamline the hiring workflow, allowing your recruiters and hiring managers to be more efficient and focus on the most qualified candidates. Customized Career Site – Allow candidates to find and apply for positions on a fully branded, configurable career site. Internal & External Job Postings – Easily post open positions to internal and external career sites. Quickly and easily receive online applications for employment, all in the same portal. Job Descriptions – Create job descriptions and requisitions from a library of built-in templates helping you maintain consistency and stay within company guidelines. Management Reporting & Analytics – Run a full range of customizable reports on your applicants, approval status, and all EEOC, OFCCP tracking. 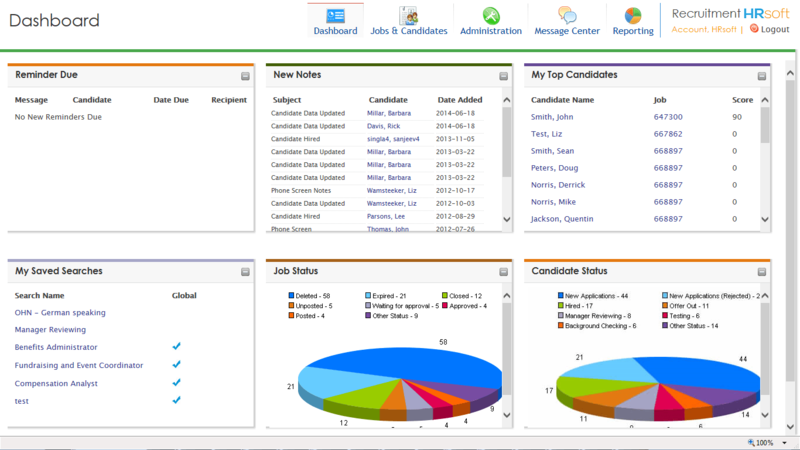 HRIS Integration – RECRUITview™ seamlessly integrates with all major HRIS systems and other 3rd party applicant tracking tools such as background screening, WOTC screening & onboarding. Learn everything you need to know about RECRUITview. Our experts will reach out to you shortly.